The West Midlands smart travelcard has for the first time been made available to bus passengers in an area that is not a full member of the region's combined authority. Thousands of bus users in Redditch are now able to use the Swift card on all Diamond and Johnsons bus services in the Worcestershire town, either as pay-as-you-go or as one or four week season tickets. Swift is run by Transport for West Midlands (TfWM), the transport arm of the West Midlands Combined Authority (WMCA). Although not a full constituent member of the WMCA, Redditch has non-constituent status and is a key town in the wider travel-to-work commuter area of the region. Cllr Roger Lawrence, lead member for transport for the WMCA, said the roll-out of Swift into a non-constituent member was a major milestone in its development. 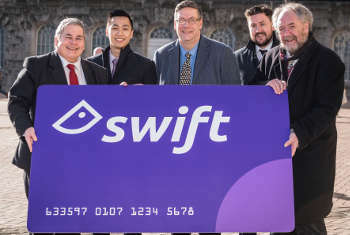 He said: ‘Swift has grown spectacularly in a short period of time, with three and a half million journeys per month, meaning it is already the largest travel card outside London. ‘With new opportunities to use Swift in and around Redditch and on Diamond services in the Black Country, even more people can now benefit from using this revolutionary ticketing system. Swift was launched in 2012. Users pay cheaper fares than with cash and there are a range of products. Staff from TfWM will be in the Kingsfisher shopping centre in Redditch on Saturday (February 17) from 10am to 2pm, to explain how Swift will work. They will be giving out free Swift pay-as-you-go cards with £5 credit to the first 100 people to visit the stand.